Alternative title: I heart Smitten Kitchen. 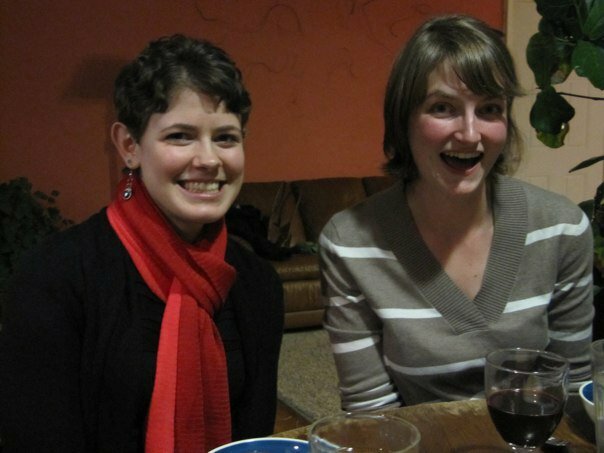 We have been great friends since college, and have always enjoyed cooking together. We made a feast of spinach soup with a yogurt drizzle & Parmesan crisp topping, fennel & beet salad, kale chips, roasted veggies, and marinated tofu. 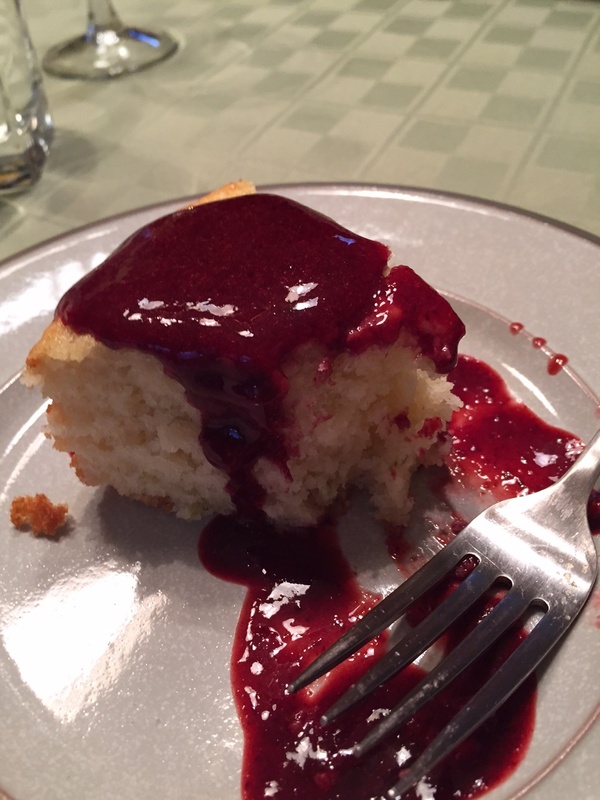 But the star of the show was our chosen dessert, Smitten Kitchen’s lime yogurt cake with blackberry sauce. The cake is light and fluffy, with a nice tender crumb from the yogurt. It is bursting with lime flavor and is complemented perfectly by the blackberry sauce. I especially like that neither the cake nor the sauce are super sweet. 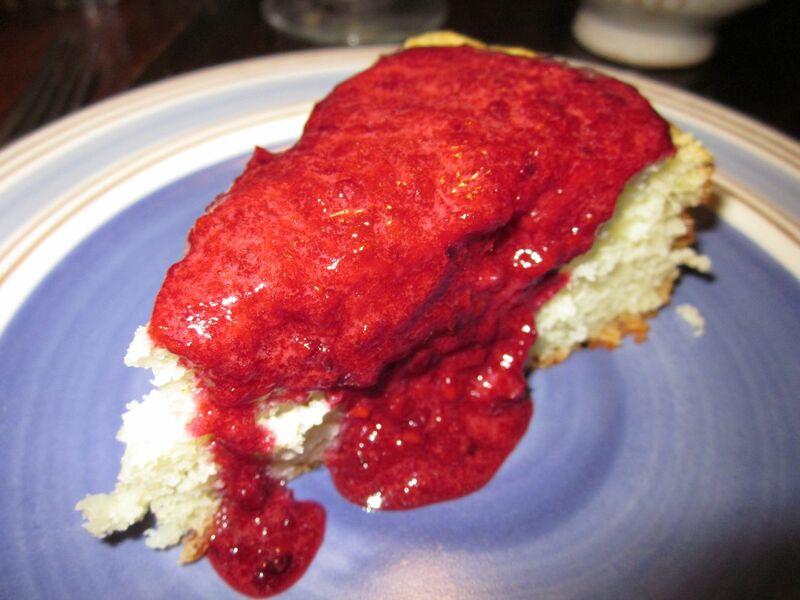 The blackberry sauce has very little added sugar, so it’s a nice tart contrast to the creamy cake. The cake was a hit that night, and it was a hit again when I took it to a recent small group dinner. It served as a great early spring dessert, when there aren’t any fruits in season, but you’re ready for something light and refreshing. I think the highest praise was from our friend Kimberly who wanted a second piece. This is rare–the woman is picky about her desserts and doesn’t love super-sweet ones. Here’s a picture of my slice. I was too eager to dig in, hence the multiple bites that are already gone. I don’t change the cake at all from the original recipe. I will say that straining the berry sauce takes time, but is totally worth it. I always think I’ll make the sauce ahead of time so I can let it sift through the strainer on its own, but then I forget and find myself mushing the sauce through a sieve with a rubber spatula and begging it to go faster. Any leftover berry sauce is great as an oatmeal or yogurt topping. I also recommend that you make pretty much anything and everything posted on Deb’s site. I love Smitten Kitchen recipes, and I feel safe making them for company without trying them out first, since I know they’ve been tested multiple times. What is your favorite spring dessert? © 2019 Rhymes with Cookie. All rights reserved.